Dominic A. Brandy, M.D.- Pittsburgh, Pennsylvania. The author reports on his first 85 cases using the QuickLift procedure, a modification of the S-lift facelift developed by Saylan. Saylan first reported his S-lift approach in 1999, and must be given credit for the idea of using a permanent purse-string suture firmly anchored to the deep tissues overlying the zygomatic arch to uplift the sagging superficial musculoaponeurotic system (SMAS). The anchored purse-string suture has 2 major advantages: It allows a great amount of force to be exerted on the SMAS, and the procedure can be performed in a very small space. The S-lift improves sagging facial features with no sedation, limited undermining, quick recovery, and minimal risk. The author has improved the S-lift procedure by substantially altering the shape of the incision, the direction of skin advancement, the extent of undermining, and the number of purse-string sutures used. 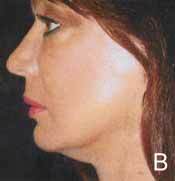 These improvements can yield better results in the neck region and, in most cases, in older patients with significant skin redundancy, than those achieved with the conventional S-lift procedure. It is not known who performed the first face-lift procedure, but literature indicates many surgeons performed the procedure in Europe and America during the early 1900s (1). Stephenson (1) credits von Hollander with publishing the first article on facelifts in Max Joseph's Handbuch von Kosmetik in 1912. In the early, 1900s, well-known European surgeons Lexer (2), Joseph (3-5), Passot (6,7), Morestin (8), Bourguet (9), Lagarde(10), and Noel(11,12), also expressed a great deal of interest in facial cosmetic surgery. According to available information, early facelift procedures, such as the ones described and illustrated by Passot (7) in Chirurgic Esthetique du Visage, were limited in the extent of undermining, and did not address the superficial musculoaponeurotic system (SMAS). Consequently, these early facelifts had a short life span. As time passed, more complex procedures involving more extensive skin undermining with SMAS plication or imbrication were developed (13-1.5) In the early 1990s, Hamra (16) introduced the composite rhytidectomy, which involves aggressive undermining of the face in a deep plane, and the elevations of the SMAS, cheek fat, and orbicularis oculi muscles in unison. Because of its more aggressive nature, this procedure has a higher complication rate, and patients have a relatively long disfigurement period. Hamra (16) recommends his patients take four to six weeks off from work, optimal results will take six to 12 months because of the slow resolution of edema. Subperiosteal procedures (17-19), also recently introduced, have the same problems of a high complication rate, long disfigurement period and edema, which can remain for six months or longer. The author reports no actual or potential conflict of interest in relation to this article. Because of the long recuperation phase and high complication rates associated with these procedures, there has recently been a movement towards more conservatism with the facelift procedure. This trend has occurred primarily because patients with busy lives do not want to deal with prolonged swelling or a high risk of complications. In addition, surgeons hesitate to perform higher-risk procedures because of the litigious nature of American society. A technique addressing these concerns, while at the same time remaining viable, is the conservative S-lift, introduced by Saylan (20) in 1999. Because of its relative lack of serious complications, short recovery time and good long-term results, this procedure has gained great popularity over the past few years. 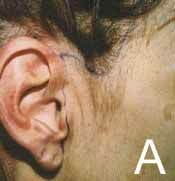 An S-shaped initial incision in the preauricular and temporal areas. An oval-shaped undermining, approximately five centimeters anterior to the ear. Skin redraping at a 45° angle (Figure 1C) with minimal tension. Minimal tension is possible because the bulk of the tension is on the purse-string sutures. Figure 1. (A) Prior to undermining, excision performed in the preauricular and temporal areas in the shape of an S. Excision width of one to two centimeters is achieved with this approach. (B) The permanent 2-0 Ethibond vertical U-shaped and oblique O-shaped purse-string sutures go into the superficial ucsuloaponeurotic system and are anchored to the deep tissues overlying the zygomatic arch. (C) Skin redraping at a 45° angle vector with minimal tension. Minimal tension is possible because the bulk of the tension is on the purse-string sutures. In short, the S-lift procedure features a limited incision length and minimal skin undermining, with the suspension of sagging facial features by two strong permanent purse-string sutures anchored to the tissues covering the zygomatic arch. Because of the limited undermining required for the S-lift procedure, it has many advantages (21): The procedure can be performed using only local anesthesia (without oral or intravenous sedation,) no hospitalization or bandages are required and most patients can comfortably return to work in one to seven days, depending on pain tolerance and propensity for bruising or scarring. 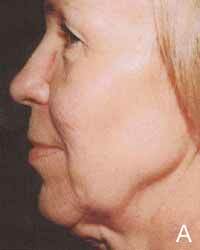 Complications are far less likely when compared with conventional facelifts, and there is a much smaller scar. Because of its composite nature, the S-lift minimizes the telltale pulled-back appearance of a conventional facelift. In skilled hands, the operation can be completed in 60 to 75 minutes. It can also be safely combined with chemical peels and laser skin resurfacing procedures (21). Initially, the author performed the S-lift as described by Saylan (20), and was impressed with the results, but found some aspects of the procedure impractical and surgically imprudent. These observations are the crux of the modified S-lift procedure that the author has named QuickLift(tm). It is well accepted by most cosmetic surgeons that precise preoperative scribing can be the most critical aspect of a given procedure. This precept is especially true for the S-lift modification described in this article. Scribing is initially performed with Bonnie Blue ink, and is subsequently overlaid with an indelible Pilot marker. Unlike the original S-lift described by Saylan (20), the superior lines are drawn approximately three millimeters behind the anterior edge of the temporal hairline (Figures 2 through 4) instead of into the temporal hair. The primary reason for changing this portion of the incision is to avoid posterior movement of the hairline, and to allow for greater superior advancement of the flap. This approach also allows three millimeters of hair matrices to be trapped under the scar and beneath the skin just anterior to the scar. Three months after the surgery, these buried hair matrices will start sprouting hair through, and anterior to, the scar line. Figure 2. (A)The initial incision for the QuickLift starts superiorly 3 mm behind the temporal hairline and extends to the preauricular area and ends in the posterior case of the earlobe with a 1-to-2 cm hockey-stick incision parallel to Langer lines. (B)This configuration allows for greater superior advancement of the flap with a better smoothing effect to the skin inferior and posterior to the earlobe. If removal of 1 cm of superior skin is anticipated (estimated by pushing upward on the patient's facial skin), the temporal incision should be extended 1 cm superior to the top of the ear. (C)If removal of 2 cm of superior skin is anticipated, the temporal incision should be extended 2 cm superior to the top of the ear. Figure 3. (A)Diagram shows the degree of subcutaneous undermining on the average QuickLift patient. (B)Instead of performing a U-shaped and O-shaped purse-string suture, the author utilizes one very large O-shaped suture. (C)The vector of advancement with the QuickLift procedure is usually from 45° to 75°. The choice of vector depends on the desired aesthetic result. The extent to which the temporal incision line will be extended in a superior direction will depend on the amount of skin to be excised by the cosmetic surgeon. If removal of one centimeter of vertical skin is anticipated (estimated by pushing upward on the patient's facial skin,) the temporal line will be extended one centimeter above the superior aspect of the helix (Figure 2B.) Conversely, if removal of 2 centimeters of vertical skin is anticipated, the line will extend two centimeters above the top of the helix (Figure 2C.) Likewise, if the removal of three centimeters of skin is estimated, the incision will be extended three centimeters above the helix. It is highly unusual to remove more than three centimeters in a superior direction, but if more skin is excised, the temporal line should be extended superiorly in a 1:1 ratio. This ratio allows the extra skin that will be created on the medial side of the excision to be pleated appropriately so an unsightly "dog-ear" is avoided. Figure 4. Preoperative markings on the anterior (A) and the posterior (B) aspects of the procedure site. Once the superior aspect of the proposed incision is completed, the middle portion is scribed. This portion follows the anterior border of the helical crus, traverses on the tragal rim, crosses the incisura intertragica, and follows the anterior crease of the earlobe (Figures 2A and 4A.) This line is then extended around the earlobe 2.5 cm into the posterior earlobe crease and approximately one to two centimeters from the crease of the posterior earlobe in a hockey-stick configuration (Figures 2A and 4B). The greater the anticipated skin removal, the longer the hockey-stick line will be (Figures 2B and 2C.) This posterior hockey-stick configuration does not exist with the S-lift or other S-lift modifications, such as the MACS-lift (22) and the Delta-lift (23). The author believes this posterior hockey-stick component, along with greater inferior undermining, creates a much better result in the neck and postauricular region by eliminating dog-ear formation and smoothing out the neck region. This hockey-stick incision should follow Langer lines so the scar will heal with minimal detectability (Figure 5). 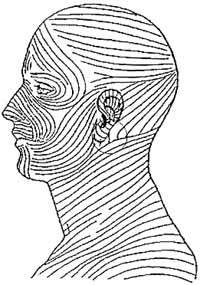 After completing the line of incision, a mark is made five centimeters anterior to the earlobe, parallel to the Frankfort line. Another mark is made five centimeters from the earlobe to the mandibular ridge, and a third mark is made four centimeters from the earlobe directly inferior. A line is then drawn from the most superior aspect of the temporal incision line, to each of the marks on the cheek, to the hockey-stick line extended from the posterior earlobe crease (Figure 3A.) This latter line will dictate the extent of the undermining. As shown in Figure 3A, there is greater inferior and posterior undermining in relation to the earlobe than in the S-lift procedure. 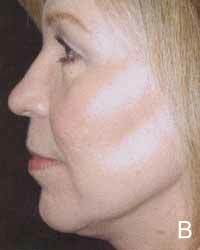 A final mark is made along the length of the papable facial artery where it crosses the mandibular ridge. It is important to mark the facial artery at this point because this is where the mandibular branch of the facial nerves become a little more superficial. When performing the purse-string suture, it is more important to avoid this nerve, as injury could cause temporary or permanent neurapraxia. Preoperative marking; therefore, gives the surgeon some idea as to where this nerve would be encountered. Figure 5. The posterior hockey-stick incision, off of the 2.5cm incision the crease of the posterior earlobe, is made in the Langer lines. The QuickLift is performed as an outpatient procedure with either local anesthesia alone or with a combination of local anesthesia and oral sedation (diazepam and oxycodone.) If more intense sedation is requested, an intramuscular injection of midazolam (0.07 mg/kg) is administered, or the patient is given intravenous sedation. The patient is brought to the operating suite where the face is prepped with Betadine® Solution. Tumescent infiltration with local anesthesia is provided with a 22-gauge spinal needle by using a diluted solution of 0.25% lidocaine with 1:400,000 epinephrine. Approximately 10 to 15 minutes are set for adequate vasoconstriction of the skin that has been anesthetized. The incision is begun at the temporal hairline. It is critical to bevel the No. 15 Bard-Parker scalpel blade 45° away from the hair, so three millimeters of the hair matrices will be buried under the eventual scar and skin anterior to the scar. The incision then follows the anterior border of the helical crus, traverses the tragal rim, crosses the incisura intertragica perpendicularly, incises in the anterior earlobe crease, and continues around the earlobe crease (Figure 4A.) The hockey-stick line scribed from the posterior earlobe crease line (Figure 4B) is not incised at this time. It is important to note the length of the hockey-stick incision will vary according to the amount of excess skin at the posterior earlobe. This is why it is performed later in the procedure. The undermining of the skin flap is performed in a subcutaneous plane with facelift scissors, and is performed within the lines scribed on the cheek area (Figure 3A). The skin flap is undermined by making adjacent tunnels with a spreading motion, and then cutting the bridges between the tunnels. This process is done very quickly, primarily because of the turnescent infiltration performed earlier in the procedure. Once undermining is completed, time is taken to obtain hemostasis. After finishing hemostasis, 1% lidocaine with 1:100,000 epinephrine is injected into the zygomatic arch approximately one centimeter to the helical crus. The SMAS is now plicated with a permanent 2-0 Ethibond purse-string suture. The anchor stitch is passed deeply into the area that was injected with 1% lidocaine hydrochloride with 1:100,000 epiniephrine. The suture is initially passed at the superior border of the zygomatic arch, goes down to the periosteum of the mid zygoma, and up through the inferior border of the zygomatic arch. Thereafter, one centimeter bites are taken in the shape of a large oval, extending down to the mandibular ridge, and then following once centimeter behind the leading edge of the undermining (Figure 3B.) When approaching the facial artery, it is critical to avoid overly deep bites so the mandibular branch of the facial nerve is not damaged. The purse-string suture is tied under maximum tension, exerting vertical traction on the platysma and a 45° to 60° angle traction on the jowl and marionette region. After tying the first throw of the knot on the purse-string suture, it is critical the surgical assistant grab the knot with a needle holder so the strength of the suture is not weakened. Once the second throw comes to the point of the needle holder, the surgical assistant releases the first knot, and the second throw is completed. Thereafter, four more throws are made so a total of six throws are made before leaving a two- millimeter tag on the final knot. Because this oval shaped suture (Figure 3B) is larger than the O-suture of Saylan (Figure 1B,) there is a tendency for the tissue within the large oval to pucker anteriorly. This tissue is trimmed using Thorek scissors or cautery so it lies flat and is even with the surrounding tissue. Once the purse-string suture is completed, there is typically some dimpling of the skin just beyond the limits of the undermining. These are corrected by freeing the retracted skin with the face-lift scissors. 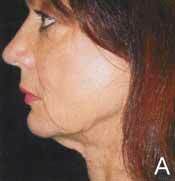 The skin is redraped at a 45° to 75° angle (Figure 3C,) depending on the effect the surgeon wants to achieve on the jowl and neck regions. The initial area of skin excision is accomplished in the temporal area. This excision is accomplished by tugging on the skin in the desired vector with a clamp, and visualizing the overlap by looking underneath the advanced flap. Once the precise overlap is determined, a line is drawn on the flap at those points. After the appropriate excision, the skin edges are stapled together for temporary approximation. Similar customized excisions are then performed in small segments inferiorly, and these are also temporarily stapled. When approaching the posterior earlobe region, there sometimes can be a prodigious amount of extra skin. This situation usually occurs when two to three centimeters of skin width is excised at the temporal region. At this time, the surgeon will make the hockey-stick incision that was drawn preoperatively. However, the length of this incision will be adjusted (Figured 2B and 2C.) Obviously, if there is great excess, the incision will be longer (typically two centimeters,) and if there is minimal skin excision, the incision will be shorter (usually one centimeter.) Once the hockey-stick incision is made, the appropriate Burow triangle is excised. Figure 6. A 53-year-old woman before (A) and 1 day after (B) the QuickLift procedure. Notice minimal swelling and postoperative bruising. Each staple is then individually removed and replaced by a 5-0 PDS II deep dermal suture. Magnification with a 2.5x loupe is used for the placement of each suture. After all of the staples are replaced with deep sutures, the author takes a 6-0 fast-absorbing gut suture, and runs a continuous suture along the entire incision line. Magnification with an expandable 3.5x loupe is used for this closure. In the author's view, it is imperative to take small and shallow bites under intense magnification to attain the best chance for consistent optimal scar healing. This highly magnified approach is also important to achieve the best chance of obtaining hair growth through and in front of the temporal scar line, secondary to the beveling approach previously described in this article. It is well-known that cardiovascular surgeons use intense magnification when performing vascular anastomoses because of the added precision magnification provides. The author has found using similar magnification when suturing the QuickLift incision improves the accuracy of coaptation and promotes more consistent, refined healing. From August 2003 to February 2004, the author performed 85 QuickLift procedures on ten men and 75 women. The mean age was 57 years, ranging from 40 to 72 years. Thirty QuickLift procedures were performed with local anesthesia alone, 32 with oral sedation and local anesthesia, 20 with oral and intramuscular sedation and local anesthesia, and three with intravenous sedation and local anesthesia. Although the procedure can easily be performed with only local anesthesia, many patients want oral sedation because of their fear of surgery. On average, the procedure, took 60 to 90 minutes. During the first three days after the procedure, almost all patients experienced tightness, ear discomfort and limitations in opening their mouths. These sensations are due to the purse-string suture, and usually subside after the first week. Most patients had mild swelling and minimal bruising, primarily in the area inferior to the earlobe. The swelling (fuller, rounded face) subsided within one to two weeks. The bruises were covered with makeup the first day postoperatively, and were completely resolved within two weeks in all patients. In almost all cases, a turtleneck covered the affected areas. Several of the patients returned to work in one to two days, but most returned in three to seven days. There were no expanding hematomas which required evacuation, but there was one patient who developed a small 1x2-mm necrosis in the preauricular region. No cases of nerve damage were reported. Starting at approximately three months, hair growth through the temporal scars was seen in almost all patients. From a surgical viewpoint, the primary advantages were similar to those of Saylan's S-lift procedure: Shorter operative times (60-75 minutes in skilled hands), absence of major complications, quick recovery time, minimal scar length, high patient-satisfaction rate, absence of a pulled-back appearance (due to the composite nature of the procedure,) and the ability to perform the procedure with only local anesthesia. Cosmetic surgeons are well aware there are many ways to rejuvenate the face. The two primary aspects of facial aging are wrinkles and sagging tissue. Facial wrinkles are caused primarily by intrinsic and extrinsic aging of the skin in areas over dynamic muscle movement. Figure 7. A 56-year-old woman before (A) and 4 months after (B) the QuickLift procedure. Stability of the initial effect was observed. When treating this problem, physicians can use retinoids, a-hydroxy acid, chemical peels, laser skin resurfacing, nonablative lasers, radiofrequency devices, botulinum toxin type A and fillers with great success. Conversely, sagging tissue involves intrinsic and extrinsic aging of the skin accompanied by atrophy of muscle, fascia, fat, and bone. When treating sagging tissue, there must be some component of skin excision and tightening of the deeper skin sutures. Additionally, fat transfers and alloplast implants can be used to build up areas of fat and bone atrophy. As previously mentioned, the original face-tightening procedures of the early 1900s were short-term because nothing was done to tighten the substructure of the face (the SMAS.) As procedures incorporating aggressive SMAS tightening became more commonplace, results had improved and were longer lasting. However, these procedures also involved longer recovery times and high complication rates. In addition, the procedures frequently created a pulled-back, artificial look because of the extensive undermining of skin, and strong lateral component to the corrections. The Saylan S-lift procedure addressed many of the problems of aggressive facelifts for most patients. The QuickLift(tm) not only addresses these problems, but also improves the S-lift itself, as summarized in the Table and outlined below. 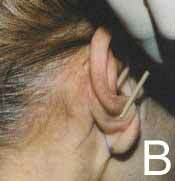 One advantage of the QuickLift, is there is no excision of skin in the preauricular area prior to the suture. Undermining of skin prior to the suture was one aspect of the S-lift that seemed surgically imprudent. Because there can be a wide variation in the amount of skin excised in patients (Figures 2B and 2C,) and because of variability in the vectors of advancement (Figure 3C,) it was apparent early on this aspect of the S-lift could be improved. The author's approach is to undermine, perform a large ovoid purse-string suture, and advance the flap in an appropriate vector based on areas of maximal skin redundancy. The next step is to systematically excise the skin flap at its superior aspect, followed by its middle, inferior, and posterior portions. This customization creates a much better coaptation of the skin, more accurate skin removal, and a finer scar. Another benefit of using the QuickLift is the superior aspect of the incision does not move the temporal hairline. Because the incision follows three millimeters behind the temporal hairline, no hair is excised, and the hairline stays in its exact preoperative position. The most critical aspect of the temporal incision is to make certain the bevel is at a 45° angle, and to use high magnification for precise skin closure. These two measures ensure the best chance for trapped hair matrices to begin growing through and in front of the scar three months after surgery. Besides preventing movement of the temporal hairline, the shape of the superior incision also allows for much greater superior advancement of the sagging facial and neck features. Flexibility in the length of the superior incision in the QuickLift procedure allows for better prevention of dog-ear formation in the temporal region. The shape of the superior aspect of the incision not only prevents the posterior movement of the hairline, but also prevents dog-ear formation, which can occur lateral to the eye in patients with excessive skin redundancy. By extending the incision along the temporal hairline in patients that require a significant superior skin excision, the advanced skin flap edge can be pleated into the patient's temporal hairline, thus preventing bunching of skin in the lateral orbital region. The hockey-stick incision at the posterior earlobe crease and the increased inferior-posterior undermining prevents posterior dog-ear formation, and promotes a greater smoothing effect of the neck region. The increased inferior-posterior undermining below and behind the earlobe has a greater smoothing effect at the neck region than what is found with the S-lift. Because of this greater undermining, one must lengthen the incision around the earlobe into the posterior earlobe crease, and create a hockey-stick line away from the posterior earlobe incision along Langer lines. This combination of increased undermining and Burow triangle skin removal posterior to the earlobe allows patients with excessive skin redundancy to be treated effectively without unsightly dog-ear formation below and posterior to the earlobe. The advancement vector is more superiorly directed. The advancement of the skin flap at an approximately 60° to 75° angle, versus a 45° angle for the S-lift, allows for a much greater improvement of the neck region. The before-and-after-photographs (Figures 6 and 7) show a good improvement in the excessive skin redundancy at the cervical area. The only way this kind of improvement can be accomplished is with an incision shape which allows for excessive skin removal without dog-ear formation, and an appropriate superior vector of advancement so the inferior sagging of the neck tissues can be adequately addressed. There is one large purse-string suture instead of two smaller purse-string sutures. This is primarily a time-saver. When observing the effects of two separate purse strings (U and O sutures) versus one larger O-suture, a difference could not be observed. Because time is of the essence and the purse-string is a foreign permanent material, it is advantageous to limit the purse-string suture to one large O-suture. The procedure works well on older patients because of its greater ability to deal with excessive skin redundancy. The QuickLift deals with greater skin redundancy much better than the S-lift. The S-lift works well on patients with minimal or moderate skin redundancy, but it is not equipped to adequately deliver a good result when excessive skin redundancy is present. This is because of the difference in the direction of advancement and in the basic shape of the excisions. The author's oldest patient (72-years-old) was very satisfied with the QuickLift approach. This article describes a modification of the Saylan S-lift called the QuickLift. Saylan must be given credit for the innovation of the purse-string suture. This suture allows a significant tightening of the SMAS because it is anchored deeply into an area that has no critical nerves or blood vessels. This purse-string suture can be performed in a very small space, which allows the surgeon to accomplish good results with minimal undermining. The main advantage of the QuickLift(tm) modifications is that it can treat older patients more effectively because of its ability to handle excessive skin redundancy. This increased capability is due to a significant change in the shape of the incision, a more superior vector of the advancement, and customized removal of skin after the placement of a single large ovoid purse-string suture into the SMAS. The QuickLift(tm) is performed in a short time, patients wear no bandages and most return to work one to seven days after the procedure. Many QuickLift procedures are performed using only local anesthesia. Serious complications are rare because of the minimal nature of the undermining. Results remained stable over the time reported in this article. Stephenson KL. "The mini-lift," and old wrinkle in facelifting. Plast Reconstr Surg 1970;46:226. Joseph J. Plastic operation on protruding cheek. Dtsch Med Wochnschr.1921;47:287. Joseph J. Nasenplastik and sonstige gesichtplastik nebsteinen anhang tiber mammaplastik. Leipzig Curt Kabitzsch..1928:525-527. Joseph J. Verbesserung meiner hangermangenplastic (melomioplastik). Dtsch Med Wochnschr. 1928;54:567. Passot R. La cheirurgie estetique des rides du visage. Presse Med. 1919;27:258. Passot R. La chirurgie estetique pure (technique et resultants). Paris Gaston Doin Cie. 1931:176-180. Morestin H. La reduction graduelle des deformities tegumentaries. Bull Mem Soc Chir Paris. 1915;41:1233. Bourguet J. La chirurgie estetique de la face. Le Concours Med. 1921:1657-1670. Lagarde M. Nouvelles techniques pour let traitement des rides de la face et du cou. Arch Franco-Belg Chir. 1928;31:1954. Noel A. La Chirurgie esthetique son role social. Paris Mason Cie. 1926:62-66. Noel A. La Chirurgie Esthetique Clearmont (oise). Thiron et Cie; 1928. Mitz V, Peyronie M. The superficial musculoaponeurotic system (SMAS) in the parotid and cheek area. Plast Reconstr Surg. 1976;58:80. Adamson JE, Horton CE, Crawford HH. The surgical correction of the "turkey gobbler" deformity. Plast Reconstr Surg. 1964;34:598. Rees TD, Aston S. Clinical evaluation of submusculoaponeurotic dissection (Skoog) in facelift surgery. Plast Reconstr Surg. 1978;5:1. Ramirez OM, Pozner JN. Subperiosteal minimally invasive laser endoscopic rhytidectomy: the SMILE facelift. Aesthetic Plast Surg. 1996;20:463. Little JW. Three dimensional rejuvenation of the midfaceL volumetric resculpture by malar imbrication. Plast Reconstr Surg. 2000;105:267-285. Saylan Z. The S-lift for facial rejuvenation. Int J Cosmet Surg. 1999;7:18-23. Fulton JE, Saylan Z, Helton P, et al. The S-lift facelift featuring the U-suture and O-suture combined with skin resurfacing. Dermatol Surg. 2001; 27:18-22. Tonnard P, Verpaele A, Monstrey S, ets al. Minimal access cranial suspension lift: a modified S-lift. Plast Reconstr Surg. 2002;109:2074-2086. Hernandez-Peres E, Khawaja HA. The delta lift: a modification of S-lift for facial rejuvenation. Int J Cosmet Surg Aesthetic Dermatol. 2002;4:309.